This is as a follow-up to my previous question on artifact colors and the excellent answers provided there. 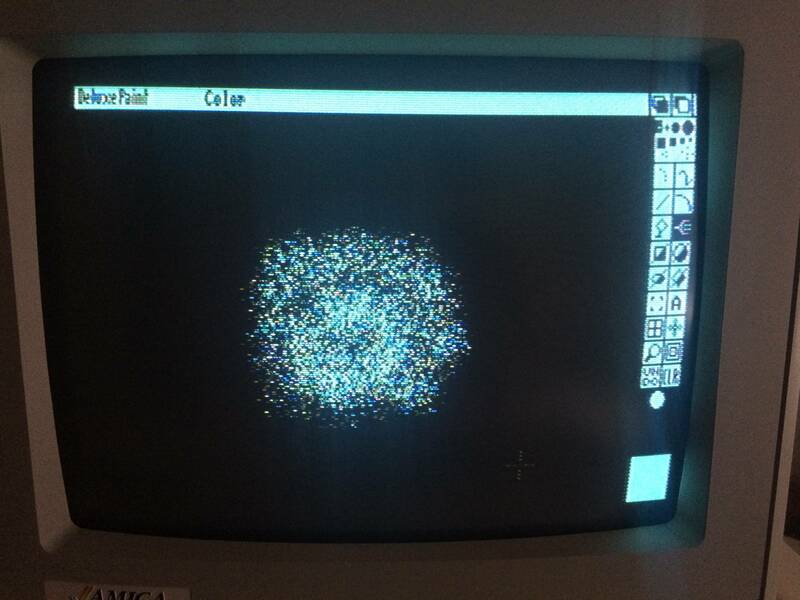 The images below show a simple example of artifact colors generated using a single bit-plane 640x200 Amiga A1000 displaying on a 1080 monitor. 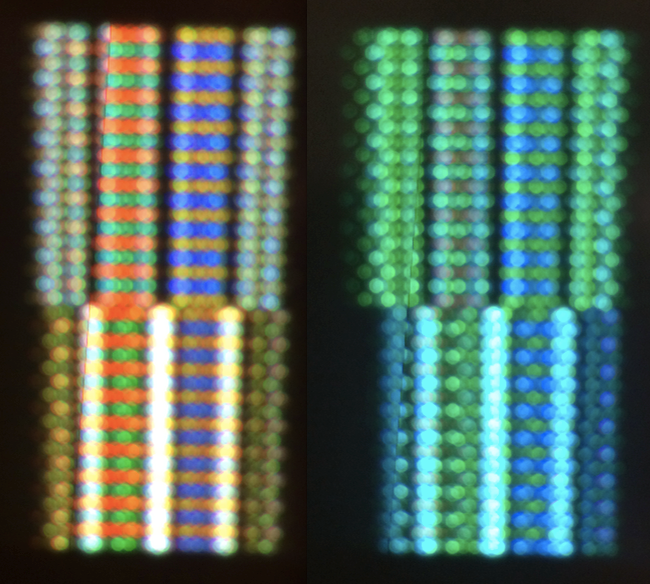 The top image is the RGB mode display, middle is the same image in NTSC Composite mode, and the bottom image is just a close-up to make all the artifact colors more visible. Here is one additional photo where, instead of random dot patterns, I created varying line patterns. The pixels on the left are from a single (1-bit plane) foreground color of yellow, while the pixels on the right are from a single foreground color set to green. The background is black for both, but can obviously be modified, to yield even more colors. Question: I am speculating that the same technique used to produce 10-bit color on the IBM CGA 640x200 display would produce 18-bit (262,144) color on the Amiga using its 12-bit native color palette and some clever Copper programming to update the two CLUT entries as needed during display. I will appreciate any answer that either validates or disputes this claim. Additionally, I am somewhat surprised that such a high-color, low-bandwidth display mode hasn't already been used for some nifty demo on the Amiga. HAM mode animations were common, but require 3x more memory/bandwidth (320x200x6 bit-planes) than this artifact color mode would need. It seems that very smooth animation or even video playback is theoretically possible with the artifact mode. 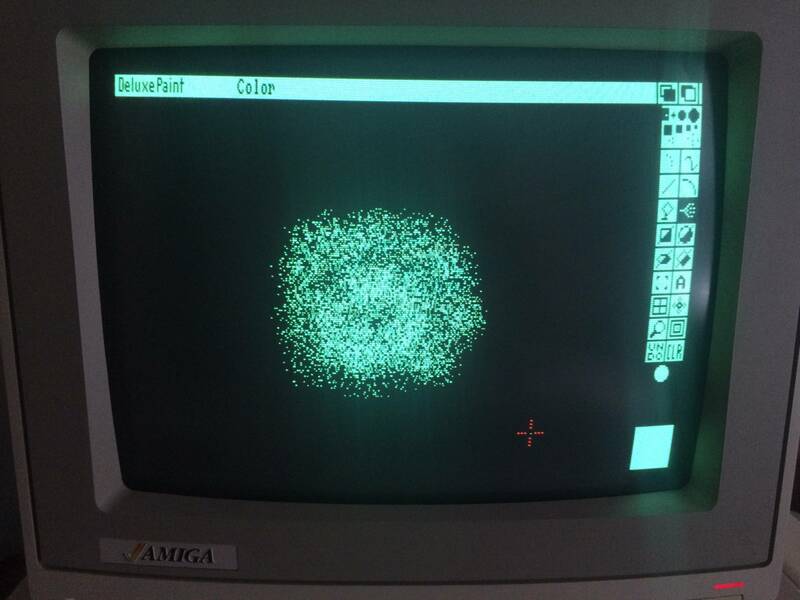 Is anyone aware of any demo or other Amiga software that ever used artifact color, or do you have any insights as to why not? I don't see a technical question, but I will attempt a guiding answer toward some of the problems. Dot patterns to trigger NTSC color phases on a TV is fine on any suitable retro platform if you accept the halved resolution. Presumably you want to keep the Lores (320x200) resolution at least, so what you can do is draw some dot patterns in Hires (640x200) right away in a 4x2 grid (twice the 2x1 you'd expect, to get artifacts from normal scanlining and lores pixel phase), and see how many distinct colors appear(n). If you can control it, you can go from 1 bitplane to 4 (16*16=256 times as many colors(n*256) - provided all are unique). Control seems unlikely, though, especially near the original 12-bit values (which will, in turn, be similarly changed if output over composite). An Amiga can likely output the same patterns as PC for CGA, so that using a CGA monitor will give you control, at the price of a reduction in colors to that of CGA. I'm aware of no Amiga demos that attempt tricks over composite. But if the goal is to get more than 4,096 RGB colors on OCS, a few demoscene prods such as Frazetta have used temporal dithering to achieve 15-bit color depth, via the PCHG format converter, using the HAMLab software to render the pictures. There are other dithering techniques such as horizontal dithering and mask dithers for so-called chunky modes (4x4 (and up) Lores hardware pixels as a software pixel). I would expect that configuring an A1000 for 640x200x16 color mode and programming all 16 colors as different gray levels would make it possible to show 65536 artifact colors on screen rather easily. Looking at your picture, it appears that repeating a four-pixel pattern on even scan lines would yield a solid color; shifting that pattern by two pixels on odd scan lines would show the same color. I would expect that programming some of the 16 palette entries as colors rather than grays would yield colors that weren't among the primary 65536, but I think the results would probably be most predictable if one used grays. Even then, I have no idea how consistent the colors would be among different machines. I would guess from your picture that in non-interlace mode the color phase would flip on even and odd scan lines, but would be the same on every frame. It's also possible that it might flip on every frame, or that it might be the same on consecutive frames but it might be unpredictable whether even or odd scan lines should be shifted. Things will be more complicated when interlace is enabled, since the required color phases will shift once every other field (i.e. 30 times/second) and I have no idea if there's any way to distinguish even versus odd fields. If selecting non-interlace mode forces a certain color phase, one may be able to count how many frames have been shown after switching to interlace mode, but I have no way of testing such a thing. No you can not. And the reason is -as you might have guess- that the Amiga OCS chipset and specially the Denise (graphic) chip can only handle 12-bit graphics = 2^12 -> 4096 colors and has only 32 color registers which are loaded with RGB values taken from the 4096 color palette. 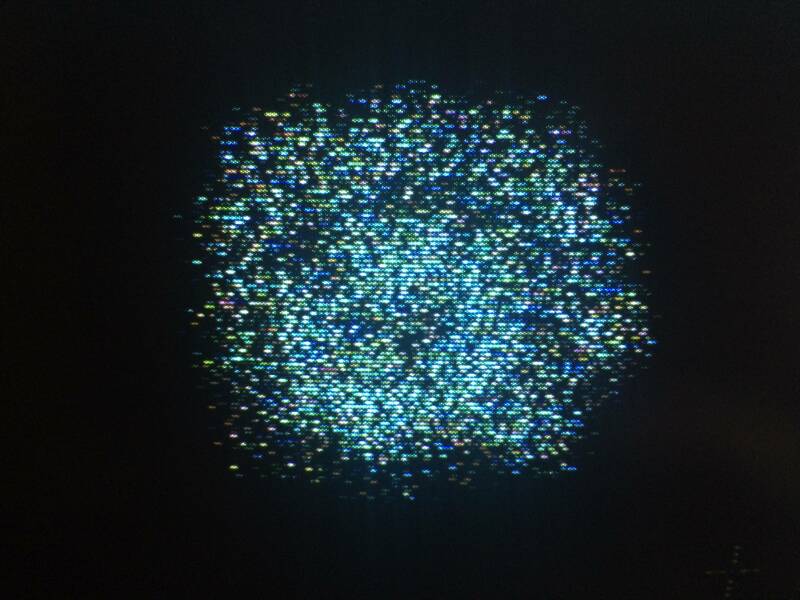 To be able to create a color palette larger than 2^12 = 4096 colors you need some external hardware connected to Amiga e.g. to the 23-pin RGB video port like HAM-E graphic card. To show more colors than the 32 colors you can take advantage of the copper to change the values in the color registers with new values every scanlline. With the Amiga AGA chipset it's another story. It has a 24-bit palette and can show up to 2^18 = 262144 colors in HAM8 mode (8 stand for 8-bitplanes in contrast to OCS chipset HAM6 - 6-bitplanes). Not the answer you're looking for? Browse other questions tagged amiga graphics color-display or ask your own question.